Doppler Photo: Photos and stories by Omari Stephens: A Call For Feedback: Yes, this means you. A Call For Feedback: Yes, this means you. I want your suggestions. Whether you've been following The Doppler Effect for a while, or you've never seen it before, I want to hear from you. Even if this is the last thing you do before forgetting about it, please do this before you forget about it. I'm interested in your thoughts and feedback, regardless of whether you and I are friends or strangers. This post has been rolling around in my head for a while now, but with the changing of the seasons, I figured it was high time to think about other changes as well. So in short, I'm interested in knowing what I should change about The Doppler Effect; what's working well, what isn't, and what things just need a couple tweaks? Leave comments on this blog post. Anonymous comments are fine. Leave a wall post on The Doppler Effect's Facebook Page. This is the big one: What should I talk about? Are there things I've been neglecting? Should I be discussing the photos themselves? The things in the photos? Other things entirely? Post frequency: My goal is an average of 1 post per week. More? Types of photos: More people photos/posts? More nature? More random stuff? Technical content: Want more? Want less? What was your most and least favorite post? While riding to work on Wednesday, I was stunned by the brilliant, changing colors of the foliage along the Steven's Creek Trail. 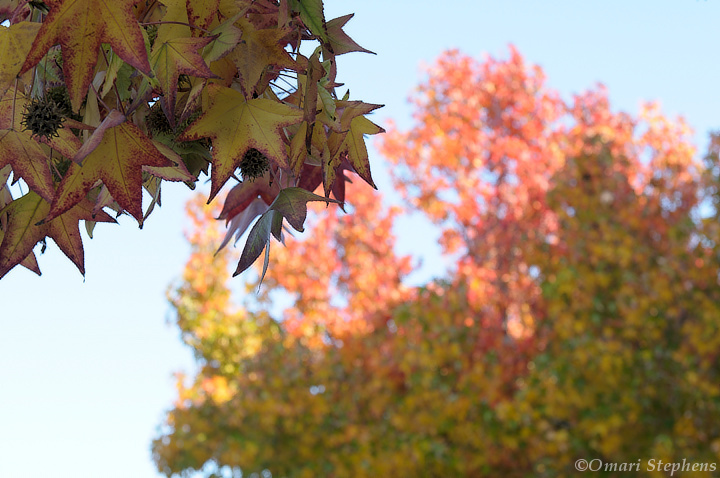 That afternoon, I was walking between buildings, spotted some multi-colored foliage and decided to take some photos. My goal was to illustrate the changing of seasons, from Autumn to Winter. As always, the first image (up above) is my favorite — I love that you can practically see the change taking place. Also, I'm a fan of small details, and the leaf is pretty much the perfect subject as far as that goes. 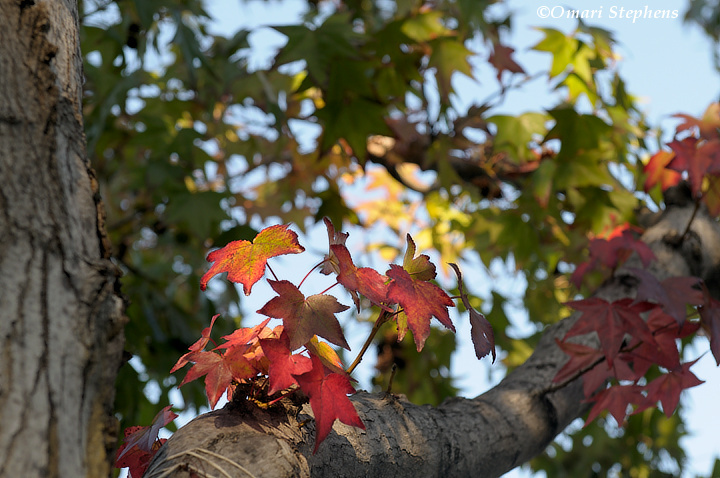 Directly above, the main subject is a leaf that's a bit farther along in the green-to-red transition. This isn't something I had noticed before, but it's neat how a single tree often has leaves that are fully green, fully red, fully brown, and everything in between. More colors! 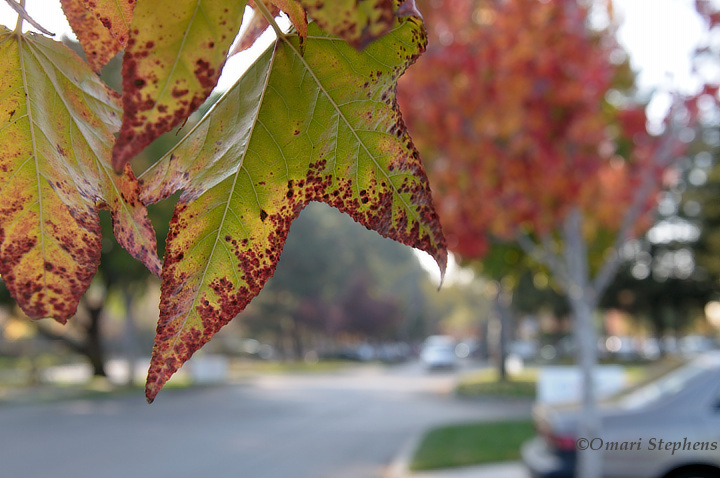 In the upper-left, there's a group of leaves where some turned completely yellow before turning red, and others are still partially or mostly green. 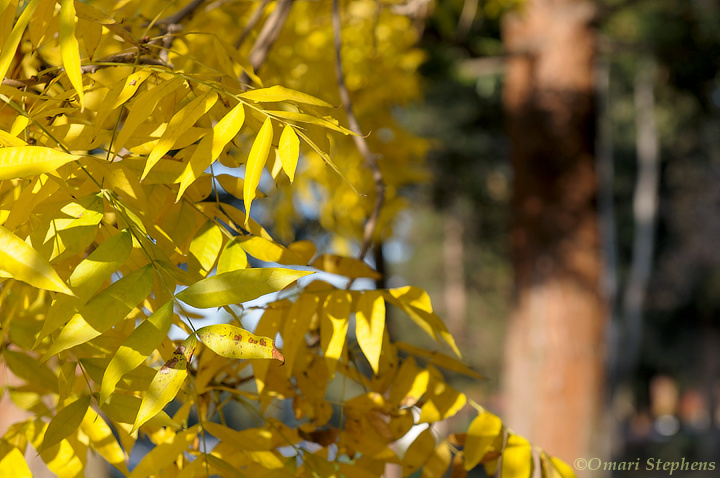 I liked the contrast of the bright yellow leaves with the little bit of brown on the leaves which are dying. The brown of the leaves also seems to match the rich, reddish brown of the evergreen trunks as well. "....you'll notice that i love color. i would wear a rainbow if i could." Nice post, good pictures. I like your post. Thanks for sharing. You should do a long term project, I like the ones with the city workers. Maybe you should follow up some of your earlier projects (like the ones that aren't just events but things that can be documented for longer). I like sotries behind the photos and how you are part of the story. I haven't been following regularly but good work! baludec9: Thanks for the feedback; I appreciate it. Ramya: Thanks as well. I actually had been thinking of doing a long-term project on graffiti, and it may still happen, but I'm concentrating on other stuff at the moment. I really like graffiti (and similar forms of communication, like multi-use chalkboards) because they bring to light neat aspects of semantics and pragmatics that are difficult to witness in other contexts. To borrow a quote from consummate photographer and teacher Mike Spinak, "Projects force you to repeatedly exhaust what you have already seen in your subjects, and then see them anew." I presume the same is true of ongoing documentation, but it'll certainly be a challenge to be the one to bear that out. The more photos the better! Write-ups are good but nothing too long. I did my 2009 blog once a month but maybe once a week is good, too. I don't know if my peeps are dedicated enough for once a week but maybe yours are! haha. Crystal: thanks. One balance I'm trying to figure out is post frequency vs. length. At this point, blog posts are my primary outlet for photos, but I'm shooting stuff faster than I can go through them and write stuff about them. I'd say my main problem is timeliness. When I was shooting for The Tech, I might shoot 2,000 photos in a weekend from two events, but then I'd pick at most 5 apiece by Monday, boom, they'd run. Done. Now, I don't hold myself to that sort of deadline. This means that instead of getting concert photos up the same week that a concert happens, it's often weeks later. One thing I'm also trying to do, though, is to make available the photos that don't make the final selection. I often find it easier and less time-consuming to pick the 5-10 images for a blog post than to pick the O(100) to go alongside. I've been thinking of trying out more of a strictly photo format (with only a couple photos, with captions, on a tight deadline). One thing I'm unsure of now, though, is how to couple that format with a desire to go back and add this ancillary stuff (the other photos that folks will probably want to see, perhaps some commentary). Any thoughts/ideas?